Submitted photo Flo is a domestic long-haired cat. She came to Greene County Animal Control as a stray that was never claimed by an owner. She is about 6-8 months old, has been spayed and has all of her shots. Flo loves to play and take long naps and would make the perfect pet for any household. Greene County Animal Control is open 9 a.m. to 6:30 p.m. Monday-Friday and 12-4 p.m. Saturday-Sunday at 641 Dayton-Xenia Road, Xenia. Potential adopters should visit at least one hour before closing to meet animals and complete adoption paperwork. Adoption fees are currently being restructured; fees include an adoption bag, microchip, vaccinations and worming. All animals are required to be spayed or neutered before adoption or by new owner at appropriate age. Flo is a domestic long-haired cat. She came to Greene County Animal Control as a stray that was never claimed by an owner. She is about 6-8 months old, has been spayed and has all of her shots. Flo loves to play and take long naps and would make the perfect pet for any household. Greene County Animal Control is open 9 a.m. to 6:30 p.m. Monday-Friday and 12-4 p.m. Saturday-Sunday at 641 Dayton-Xenia Road, Xenia. Potential adopters should visit at least one hour before closing to meet animals and complete adoption paperwork. Adoption fees are currently being restructured; fees include an adoption bag, microchip, vaccinations and worming. All animals are required to be spayed or neutered before adoption or by new owner at appropriate age. 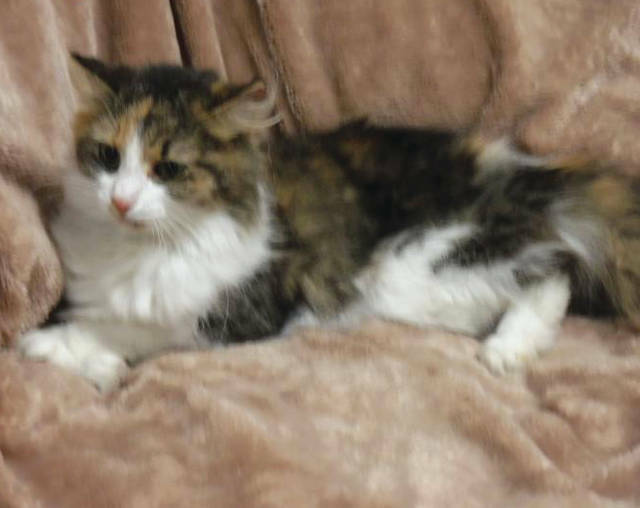 https://www.fairborndailyherald.com/wp-content/uploads/sites/50/2018/02/web1_Flo.jpgSubmitted photo Flo is a domestic long-haired cat. She came to Greene County Animal Control as a stray that was never claimed by an owner. She is about 6-8 months old, has been spayed and has all of her shots. Flo loves to play and take long naps and would make the perfect pet for any household. Greene County Animal Control is open 9 a.m. to 6:30 p.m. Monday-Friday and 12-4 p.m. Saturday-Sunday at 641 Dayton-Xenia Road, Xenia. Potential adopters should visit at least one hour before closing to meet animals and complete adoption paperwork. Adoption fees are currently being restructured; fees include an adoption bag, microchip, vaccinations and worming. All animals are required to be spayed or neutered before adoption or by new owner at appropriate age.